Winter’s Bone (2010), R, 100 minutes – Winter’s Bone is a dank and cold drama/thriller that I never would have checked out had my friend Chris not mentioned it one conversation over beers. So when he was back in town almost a month later we decided to give it a look down at the local art house theater, the one place in town that consistently screens such films. And I’m glad we did. The Town (2010), R, 120 minutes - The Town is Ben Affleck's sophomore outing as a director and with it he proves that the ability he showed behind the camera on Gone Baby Gone was not a fluke. Like Gone Baby Gone, The Town is a crime drama/thriller based in Affleck's hometown of Boston. This time around, Affleck focuses primarily on the criminals, their lives and their motives. Affleck joins Jeremy Renner (The Hurt Locker) as one of two primary characters who are both best friends and partners in crime. 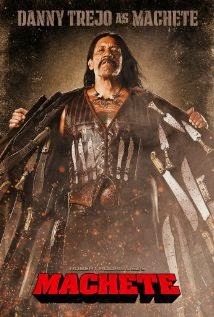 Machete (2010), R, 105 minutes – Remember that big B rate flick Quentin Tarantino and Robert Rodriguez dropped on us a couple of years ago called Grindhouse? Do you also remember how the best part of Grindhouse was the fake trailers? Well 3 years later, Rodriguez brings his fake trailer to life with a full length feature. I had been patiently waiting for The Girl Who Played With Fire to come to the Grandin Theatre back in Roanoke, but was pleasantly surprised this weekend in SC at my parent's house when I learned that it was playing at a theater about 30 minutes down the road. Not knowing when it will show up back home, I was able to sneak away this afternoon to check it out! The Girl Who Played With Fire is the second installment in the Swedish film trilogy based on the Millennium trilogy of books (the first of which was The Girl With The Dragon Tattoo). If you have not either seen the first film or read the books then don't bother taking two hours out of your day checking this out because you will be completely lost.